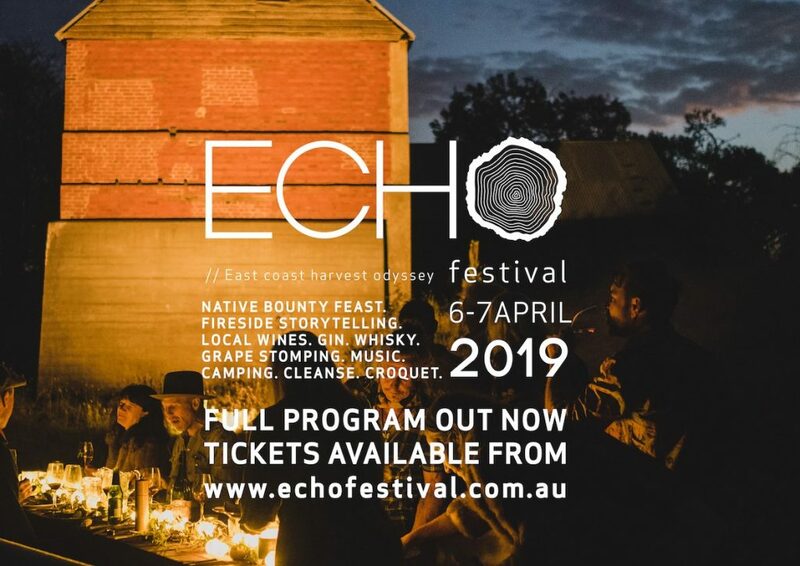 ECHO – East Coast Harvest Odyssey is a celebration of harvest through history – a festival of the senses. Set by the banks of the idyllic Swan River alongside the Gala Mill in the rural hamlet of Cranbrook on the East Coast of Tasmania on Saturday 6th from 2pm through 1pm Sunday 7th April 2019. An overnight camping experience that offers guests the opportunity to connect with nature in the amber glow of the Tasmanian Autumn. Showcasing fine local wines and produce, the Chef’s Native Bounty feast offers guests delights of local shellfish, wallaby, lamb and bush foods, cooked on the open coals. In the old Gala Mill, expert vignerons, a mistress of the still and a Scotsman will guide us through a showcase of fine Tasmanian craft spirits. Enjoy some fireside storytelling and live music in the evening before retiring to the campsite. For a premium experience, we can assist you in booking a luxurious bell tent with our friends at Tasmanian Glamping Co or direct you to local accommodation providers with the assistance of shuttle buses. Awake to coffee and a healthy breakfast (perhaps even a medicinal-grade cocktail) on Sunday morning. Get your circulation flowing with some interactive grape stomping – ‘The Great Eastern Ferment’ the product of which will be bottled and ready to taste at ECHO in 2020. A ‘river cleanse’ on the banks of the the tranquil Swan River to pay our respects and perhaps a spot of croquet on the lawns of Glen Gala..
We’ve got several wonderful recommendations for your return journey to civilisation to complete your ECHO journey on Sunday afternoon. ​We look forward to welcoming you to the very first ECHO. The $195 ticket price includes the Chef’s Native Bounty Feast (menu listed on the website), plus your local wines, gin, whisky and shellfish presentations & tastings + entertainment and activities. ​$20 camping ticket sold separately. Amenities include toilets and showers. Please bring your own tent or van. Oh, and wear warm clothes and sturdy shoes! ​$20 pp return trip from Swansea area the Gala ECHOasis festival site – available via the ticket link. Please contact the driver Paul directly on p.0438 450 834 for pick up from you Swansea area accommodation – the shuttle service will operate pick ups until midnight on Saturday night.